Rev. Dereje Tilahun, a pastor in the Ethiopian Evangelical Church Mekane Yesus (EECMY) and coordinator for LHF translations in Ethiopia, knew that something had to be done for the children of his church and others throughout the country. 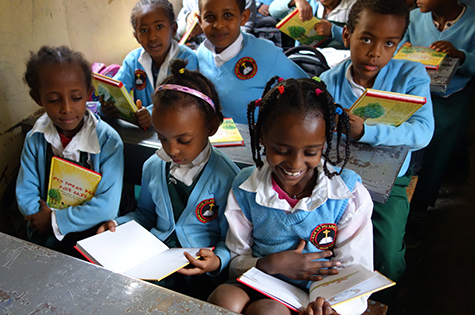 Young Ethiopian girls page through their new Bible storybooks. In April, LHF Executive Director Matthew Heise traveled to Ethiopia to begin the distribution of LHF’s Amharic translation of A Child’s Garden of Bible Stories. The colorful Bible storybook provides 60 Old and New Testament lessons, along with simple discussion questions. More than 500 students in 10 grades attend Bijiga’s Lutheran school, where the students come from a variety of backgrounds, including Orthodox Children and Muslim. 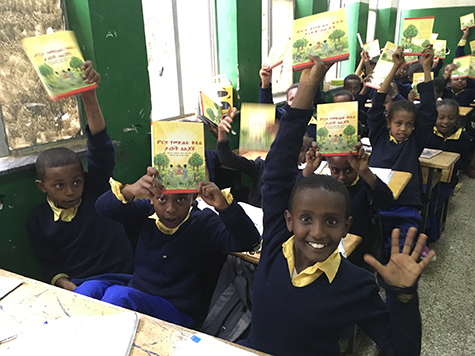 Enthusiastic Lutheran school children proudly display their new Bible storybooks, translated by LHF into the Amharic language.